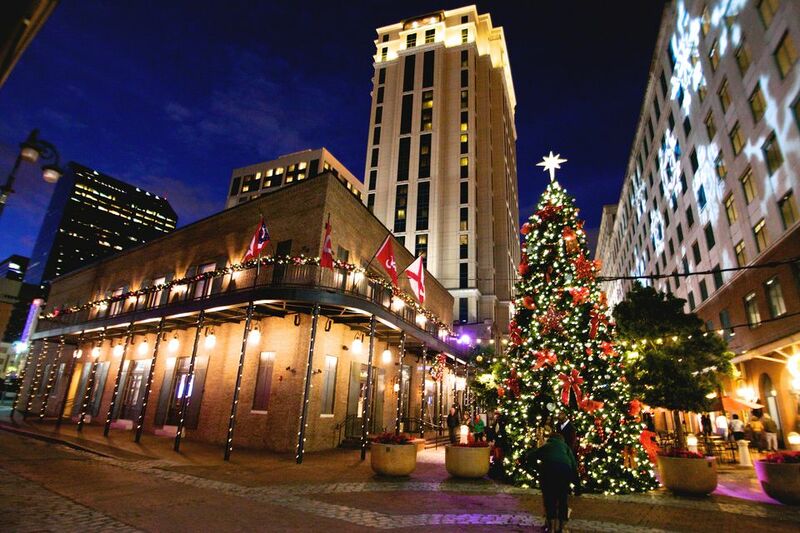 December is a beautiful and festive time of year to visit New Orleans, as the city is decked out with holiday cheer from top to bottom. Activities for children are particularly plentiful, from teddy bear tea with Santa at the Royal Sonesta to Celebration Under the Oaks, a festival of lights in City Park. The weather's also entering the cool zone (which is still a fair bit warmer than temperatures up North), which makes it possible and comfortable to bundle up and explore some of the city's exciting outdoor attractions. Additionally, chefs are starting to get creative with their gumbo, the favorite warm-me-up delicacy among locals. The weather in New Orleans in December is quite pleasant compared to a lot of other destinations in the United States. Even though the Atlantic hurricane season ends in November, New Orleans is rather wet this time of year, getting precipitation on 10 days out of the month and accumulating over 4.5 inches throughout December. Still, you can expect an average of five to six hours of sunshine per day and mostly clear skies on days that it isn't raining in the city, which will give you plenty of opportunities to enjoy the many outdoor events and attractions happening around New Orleans this December. It's very unlikely that you'll need shorts or T-shirts in the month of December; however, comfortable pants, good walking shoes, thick socks, long-sleeved shirts and extra layers (sweaters or polar fleeces), and a light winter coat are recommended. You very likely won't need a serious parka and snow boots are unnecessary, but some warm layering accessories (scarves, hats) are a good idea. As always, bring some more formal garments if you plan to dine out at one of the city's old-line restaurants or if you want to head out to a posh bar or club for an evening of dancing. Due to the cooler and relatively drier weather in New Orleans in December, there are plenty of events and attractions worth checking out on your trip to the city this month. St. Louis Cathedral Concert Series: Free classical and jazz music concerts are held many nights of the week in the gloriously elegant St. Louis Cathedral in the heart of the French Quarter all month long. Reveillon Dinners: This tradition dates back to New Orleans' days as a predominantly Catholic city when Creoles would break their Advent Fast with a huge celebratory late-night Christmas Eve dinner. Nowadays, many fine restaurants throughout the city serve these multi-course prix fixe meals starting several weeks before Christmas. Hanukkah: New Orleans has one of the oldest Jewish communities in the New World, and Jewish life in the city is thriving. Concerts and other community events are hosted by Chabad, Touro Synagogue, the Jewish Federation of Greater New Orleans, and many other smaller Jewish groups across the city. Running of the Santas: Drink, run, and drink some more all while wearing a Santa costume because New Orleans joins up with Running of the Santas events around the world this month. This one starts at the Rusty Nail and runs just a few blocks to Generations Hall, where live music and DJs and lots of alcohol will keep the party going for hours. Holiday Home Tour: This event, a fundraiser for the Preservation Resource Center of New Orleans, offers outsiders a rare glimpse into some of the Garden District's most beautiful private homes. Tickets aren't cheap ($40 for non-members), but it's easy to get a full day of fun out of the deal, and the proceeds help fund preservation projects in the city. New Orleans Bowl: The city will pack with college football fans when this NCAA post-season showdown comes to town. Caroling in Jackson Square: This sweet tradition brings hundreds of singers of all ages and abilities together for a candlelit sing-along in beautiful Jackson Square. Candles and lyric sheets are provided as long as you bring the cheer. New Year's Eve: There are smaller New Year's Eve celebrations throughout town, but the best place to be on New Year's is in the French Quarter. Instead of dropping a ball, New Orleans drops a baby (not a real baby; it resembles the tiny babies hidden in king cakes) from the top of Jax Brewery at the river's edge in the French Quarter. This oddball (but totally New Orleans) countdown is followed by fireworks over the Mississippi River and hours and hours of partying, French Quarter-style. Because it's a popular time of year to visit, hotel prices are fairly high, but deals can still be found if you dig around a bit, especially if you visit before the Christmas rush that happens from the December 15 to the end of the month. The Saints are coming to the end of their season, so it's either a very good or very bad time to talk football with the locals (and the locals all love to talk football), while the increasingly popular Pelicans are in full swing, so you should consider catching a game of one or both. One of the most uniquely New Orleans holiday celebrations this month is the Christmas Concert in the St. Louis Cathedral, which features the cathedral's concert choir and the Louisiana Philharmonic Orchestra performing traditional and contemporary favorites; however, tickets go fast, so be sure to get yours well before you visit.